Even a tiny light breaks up the darkness, but darkness can never, ever dim God’s light, or the Christ-light in you! Remember today that every person you meet has the Christ-light, too. Prayer: God, thank you for putting your light in me; what an amazing gift! Good works are our way of saying “thank you” to God for the gift of grace. Challenge yourself to say “thank you” in a new way today. Prayer: God, reveal to us new ways to respond to your grace. Amen! Revelations 21 talks about God creating a new heaven and a new earth. Although the fullness of God’s new kingdom is yet to come, Jesus also taught that the kingdom of heaven is in our midst (Luke 17:21). How might Christ want us to make “all things new” here and now? Prayer: Lord, sometimes it can be difficult to try new things. Help us to discern the path you desire for us, and give us the courage to follow you always. It’s not bragging to let your light shine, it’s just doing what God has put you here for! 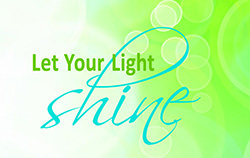 How can you let your light shine today, knowing it is what God wants for you? Prayer: Loving God, remind me when I forget that the things I am good at are gifts from you to be used for your good. Prayer: God, help me to remember that prayer is about my relationship with you. help me to remember it’s okay to take a deep breath and pray at any time. However, as it is written, “No eye has seen, no ear has heard, no mind has conceived what God has prepared for those who love him” – but God has revealed it to us by his Spirit. Isn’t it marvelous how God’s plan for us unfolds? It’s usually not in the way we expected, but always in the way that is needed for us to grow. In what unexpected ways has the Holy Spirit revealed a glimpse of God’s plan to you? Prayer: All-knowing God, send your Spirit in this place. open our eyes, our ears, and our minds to follow the divine plan you have for us. We love you, God! Amen! I came that they may have life, and have it abundantly. – John 10:10. Jesus says the reason he came was to bring abundant life to others. What type of life do you think Jesus wants to bring the people of Easter today? Prayer: O Jesus, you give us abundant life in the Spirit. help us to share that life with others in our church, our local community, and the global world we live in.